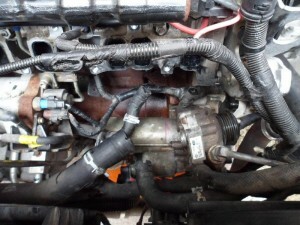 How to change water pump on 2L FWD Transit – Do your dream! After 7 years our first van had its first real component failure, which can’t be bad. The water pump seems to have failed due to a seal going between it and the power steering pump. resulting in coolant leaking very slowly down and over the starter motor. Getting it changed at a garage was quoted at £320-£380 at Ford and other garages which is a little steep. The job isn’t trivial or simple, but isn’t actually too difficult if you know what to do. Total cost using Ford bits, can be £120, or £50 for cheaper versions. However, on our investigations we didn’t find any definitive answer, so a good friend came over (Thanks Chris Rabbit!) and we tackled it together. Probably took a relaxed 5 hours, but with hindsight (and these instructions), probably a 3 hour job. We took some advice from the Ford TIS and the Ford Transit forum (thanks to the people that offered some advice) – we took some advice, ignored others, and made it work! 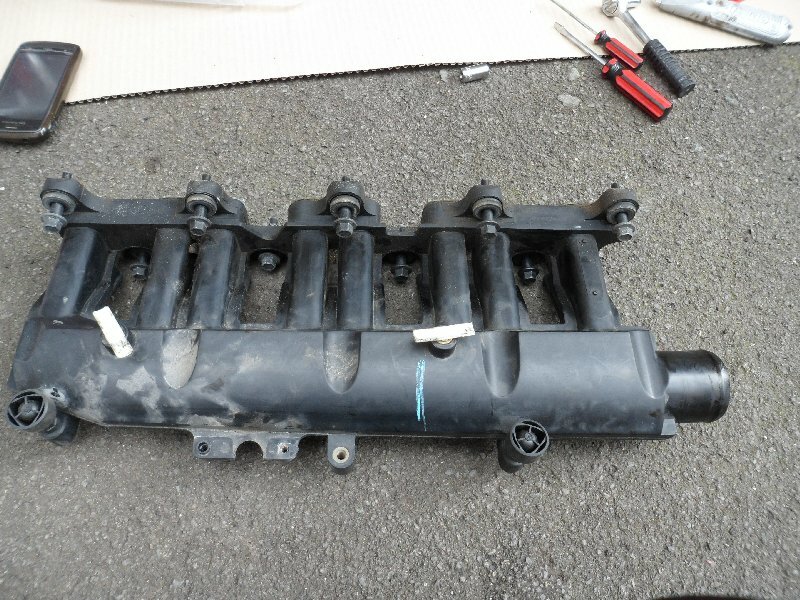 These instructions are based on a 2005 Mk6 FWD 2.0L TDCi 125ps Ford Transit. The instructions should help any 2L varient, but you may have different pipework as you may or may not have an intercooler or EGR. Recommended belt tensioner tool, though you can get away with screw drivers and 3 hands. The main problem with this job is the posititon of the water pump. In itself, it isn’t a tough job, its just a right b*****d to get at, but hopefully this guide will help. There is a drain plug, slightly recessed, in the bottom right corner of the radiator (when standing at the van looking under the bonnet). Its easier to get at underneath, and feeling (as its blind and you may have to push a cable out of the way), just undo the big plug and the coolant will drain. Put a big large container underneath as it will splash. And take off the coolant tank cap to allow it to empty. 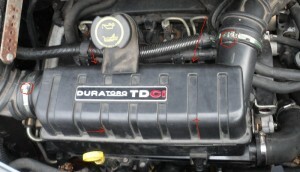 The top box with “DuraTorq” on is the air resonator. 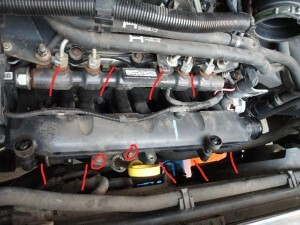 Undo the two hoses circled with a screw driver or special clip tool. Disconnect hoses. Undo the two hidden nuts at the back, you will probably need to unclip the pipework at rear. These are 12mm. 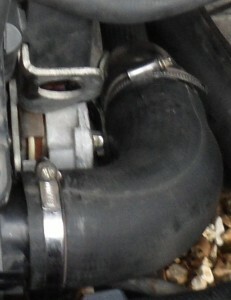 Once nuts removed, slight right-hand side of air box “back” and then rotate slightly up, and then slight right. This motion makes it clear the bungs. Make sure you don’t lose the nuts or the rubber bungs. Remove he EGR outlet pipe on the right, this is simply two jubilee clips. Be warned, this pipe may be full of black sh*t from the EGR, so it can vet very messy very quickly. 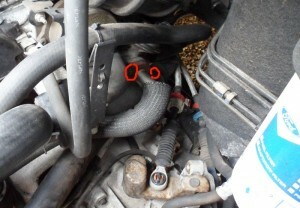 This is a simple plastic cover on the right hand side covering the power steering belt. Its a 10mm nut at the front side, and the rear just prises off with a screw driver. Had we done this at this stage it’d have made life so much easier as this entire pipe gets in the way. Ford do not recommend moving it, but really, you should! This is a bit of a pain if you don’t have a tensioner tool as the tensioner is spring loaded and keeps the belt tight, but this means the belt can’t just come off, the tensioner needs to be released. We’re sure there is a tool or technique, but reglardless, here is what we did. (Edit 14 Sept 2013: Grant (see comments, says: First, the hole on the tensioner is for a 1/4 drive ratchet to go in, makes it a one-handed, 5-second job levering the tensioner off. It’d be good if you couldput that note on the instructions). Nicely found Grant!!! Rotate screwdriver against nut and little screwdriver in direction of green arror causing the tensioner to release (under load), so with your 4th hand, get the belt off and then release the tensioner slowly. Its 9x 10mm bolts which all need to be removed. These are all captive so don’t worry about dropping them. You will possibily need a long reach socket and an extension bar just to get access, but apart from working out how to get the nuts, then should come off. There is a cable attached to white clips. We sensed if we pulled these clips they’d snap, so we removed the tape and left the clips in situ. The cable is then “free”. Be careful when removing as there are 8 rubber gaskets. They didn’t fall off for us, but keep an eye out just in case. There s a coolent hose support bracket in the way of the power steering pump, it sort of “lipped”. The Ford TIS reckons there are 4 nuts on it, but I only found two! And removing these nuts gave enough movement to move it out of the way. 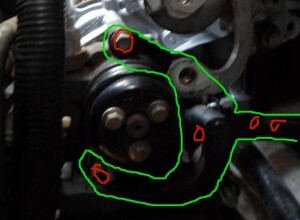 The bracket is shown in “green” and rough nut locations in red. 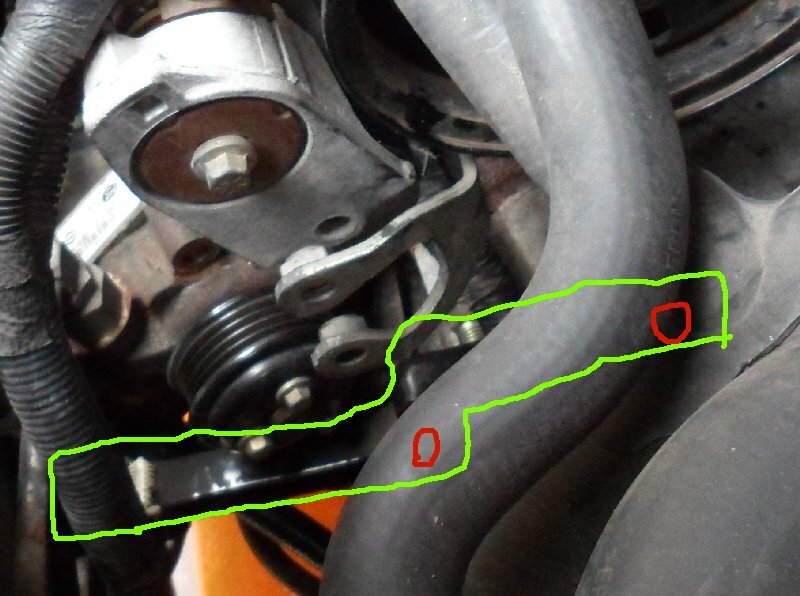 Leave bracket in engine and hoses still connected. 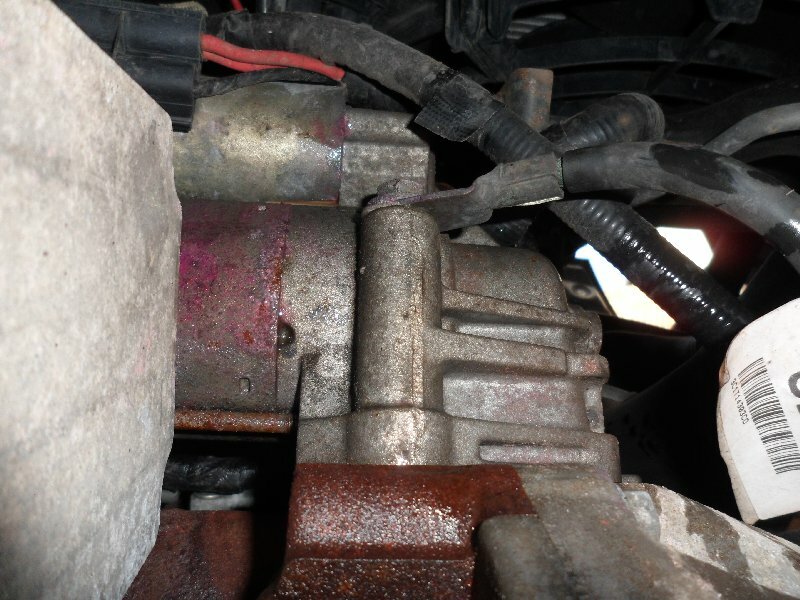 Note: The power steering pump stays in place – so be careful not to strain any pipes connected to it! 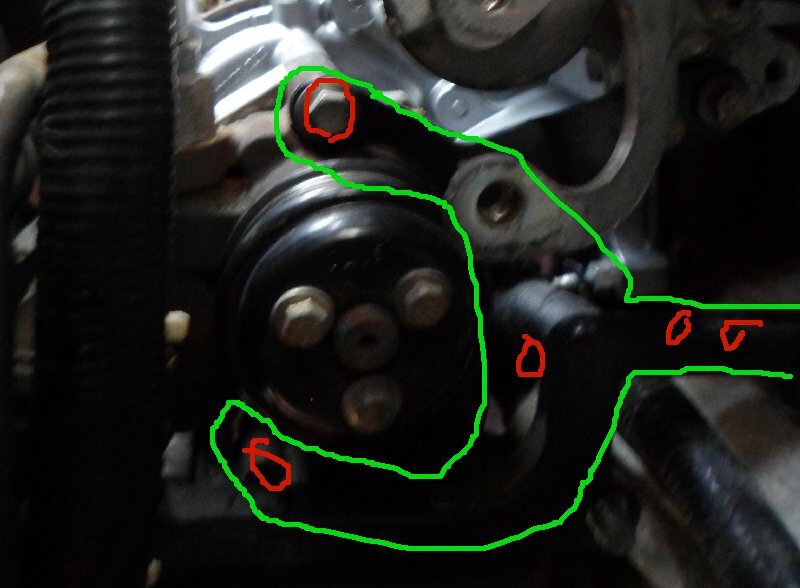 Note on image, green is rough outline of bracket holding power steering pump on, red the bolts. The top & bottom bolts are 10mm and are long and go through the water pump. Remove these. The bracket will then come off, rememeber which way round it went! The power steering pump is now free and you should be able to separate it from the water pump (pull away from water pump as the water pump has a spline going into the PAS pump. Check spline for wear, as if you have been leaking for a while and the grease has been washed out, it may be damanged and you may need a new PAS pump. We caught it early, so grease still present. Clean old grease out if you can. Disconnect 3 hoses from water pump. That special tool I mentioned at the start is very handy! There are then 4 bolts holding the water pump to the engine. The top 2 are bolts, the bottom 2 are bolts with thread both sides. At this point, have a cuppa, and clean up all the bits you think necessary. Not going to bother with pictures for reassembly, the ones above should suffice. 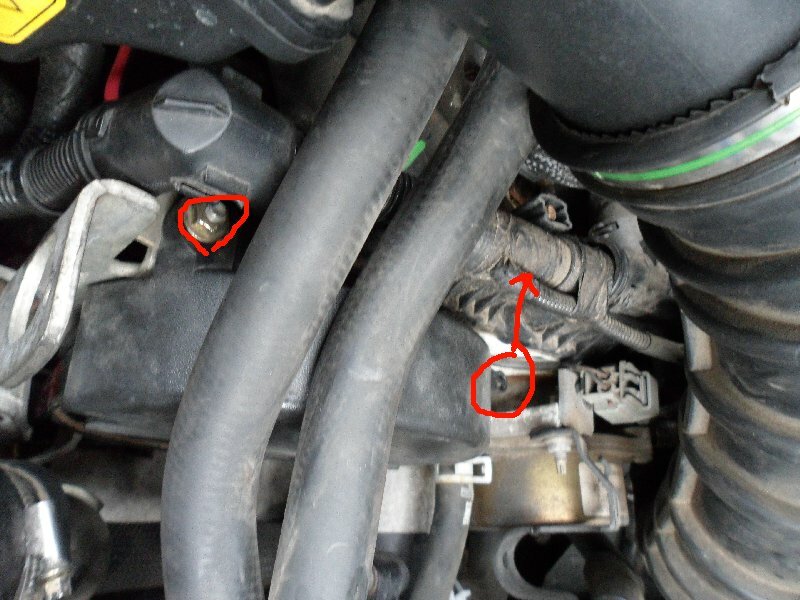 Ensure radiator drain plug is closed! 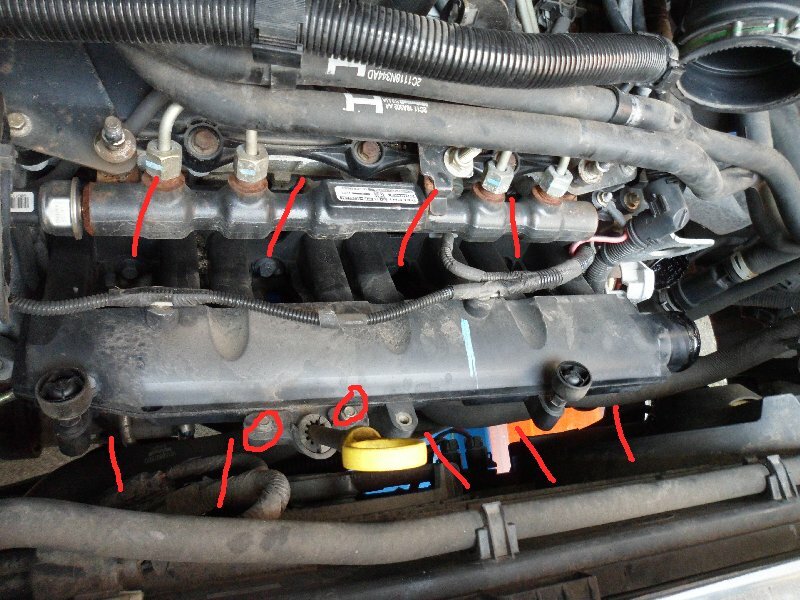 Make sure no tools balanced on engine or bonnet…. Check everything, and jobs a good un. Hope this helps someone – I know I’d have been more confident doing it had I read this at the start! Cheers to Chris again for his help. Thanks for the work and trouble you put into this piece. 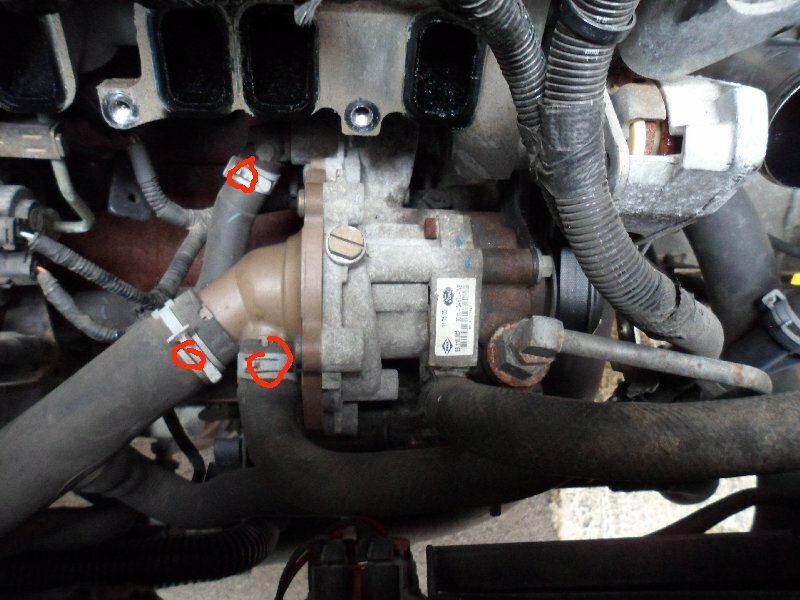 I am just about to start on changing my power steering pump and did not trust the Haynes manual to fully explain it.. so your photos are a gem. 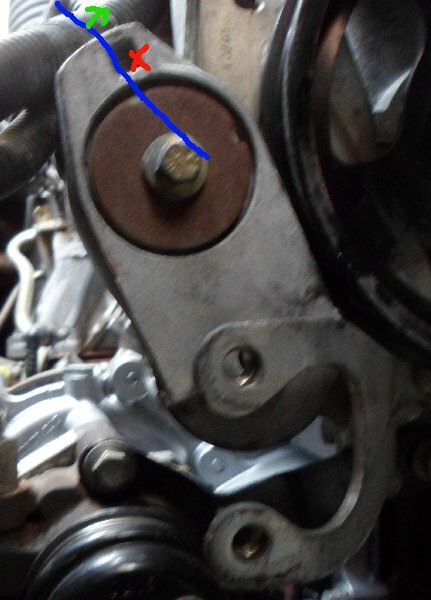 Thanks for this post completed job on my own in 4 hrs….its a pig to get to…..used a new after market pump for £30.00 inc post , lube, gaskets from ebay. Hi mate, just a couple of comments having done this job this week using your excellent notes as a guide. First, the hole on the tensioner is for a 1/4 drive ratchet to go in, makes it a one-handed, 5-second job levering the tensioner off. It’d be good if you could put that note on the instructions. 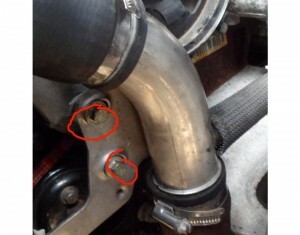 Second, the “coolant engine sensor” attached to the waterpump is better described as the oil cooler thermostat. Reason I say this is that sensor implies wires are attached to it and it caused me a panicky few minutes when I couldn’t find the wires I was looking for! Anyway, great writeup, it’s a lifesaver. Pingback: Ford Transit TDCi, low power, low boost (p0235) – Fixed! Thanks very much , was a great help as having it broken down with pictures made it a job I tackled myself (with mates of course ) !! It was my first time too, and my researched helped me, so thought I’d “pay back”. Thanks from my van an I, Ryan & Mel. The right post at the right moment !!!! Any time! Glad to help! Hey, I’m about to do the same job, but my first idea was to take out the radiator and go via the front, instead of the top (and having to removing the airintake etc). Hi Ryan, I followed your guide. I came all the way to ’10 – Remove water pump’. And then I just couldn’t reach the bottom right bold. Even with a small wrench and a knee I couldn’t make it (the angle was to steep for a wrench and knee, almost 90 degrees). Well here’s another Transit water pump victim! At least I think…. The belt snapped on the motorway, and the engine over heated straight away. Bought a new belt, put it on and it went again in like 5 seconds. So my best guess is one of the pumps have gone. I now have bought a brand new water pump and a second belt (4PK735) just to find out the power steering pump can be the problem instead of the water pump. What a sh.tty construction to fix two pumps together! I know for fact I could drive the van without power steering, but as they work together one couldn’t just disconnect the steering pump. So I hope it is in fact the water pump that is blocked, but with my luck I probably bought the wrong part, and need a new power steering pump instead. But we’ll see, thanks to this site I now know how it’s all bolted together, so I’ll give it a go. I just wonder if there would be a way to fix the power steering pump so that the belt will operate the water pump without the power steering. I mean, if the bearings of the PS pump have gone there is still a way to drive the water pump. Otherwise I will have to buy another PS pump too…. Well it turned out to be the PAS pump, and not the water pump in my case. It ran dry, and it blocked causing the water pump to block too. So now Im stuck with a brand new water pump I don’t need, and a Transit that is still not running. And indeed what a horrible job it is to get to it! Trying to find a cheap pump now a get the thing back on the road! This write up is amazing. My oil cooler thermostat was knackered. £11 on ebay or £30 from ford. ( i was desperate) after a snapped bolt, two damaged hoses later i was done. Be carefull with the wiring loom that seems dangerously close to the pully. Mine had worn four wires down to bare copper. Thank you SO flipin much for this write up. You must be a distant relative to jesus. Thanks for such a detailed description of fitting a Tranie water pump, just love my transit they keep going for ever, but once in while they do need some TLC, glad I found this post will save me a load of time complete with pics awesome. No idea – it came with the Ford water pump….. Thank you for taking the time to write up this guide.. found it extremely helpful changing my water pump.. a lot easier to follow than the Haynes manual! Many thanks for the detailed instructions very useful . Hi,just done my waterpump and pas pump,i done it the easy way.Remove both headlights,front bumper,crossmember and front panel,all bolt on.Unclip radiator top,bottom and over flow hoses and swing radiator to the side and you are there,easily accessible.All done in the afternoon,dismantled and back together,might be worth trying.It worked for me,cheers for now.